I don’t know about you, but January 1 never fails to be a day of self-recrimination. Every year, I swear it will be different. I will exercise every day. I will mail more (handwritten) letters. I’ll cut back on sugar. I’ll keep my office tidy. I’ll blog more, pitch more stories, take a stab at that novel. I’m very hard on myself. I’m guessing some of you recognize this behavior. After this last year of book-writing, once it was over and I had some breathing room, I could tell my life was out of balance. So many areas of my life took a backseat to writing, and it’s taken a toll. For the last few weeks, I’ve been making (and breaking) promises to myself about self-care. One Simple Change arrived just in time. 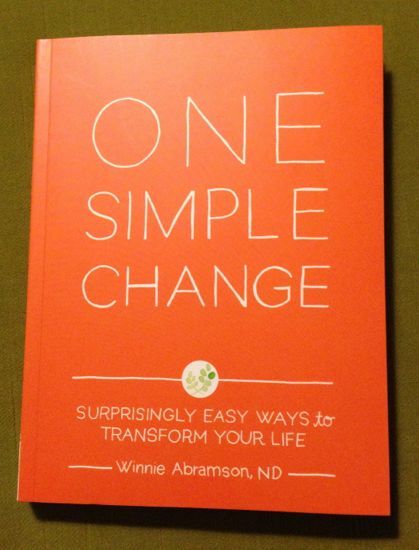 My friend Winnie Abramson’s new book is filled with intelligent, approachable ways to make changes, healthy changes, in everyday life. I’ve made a few changes already – I’m starting the day with a big glass of water. I’m exercising, sleeping more, not skipping meals, and all of this helps immeasurably. I’m being kinder to myself. The tone of this book is spot on. There’s no scolding, just smart, sensible talk and straightforward ideas and techniques and nudges. Winnie’s voice is clear. I hear her supportive, nurturing tone in every paragraph. Most days, you need a friend like Winnie. I’m going to carry Winnie’s helpful book with me through the next few weeks. I’ll admit the holidays are often a time of overindulgence for me, but I am determined to keep that at bay, and keep working at these simple changes. If you’re looking for a smart “stocking stuffer”, a book to jump start a new year, One Simple Change is just what the doctor ordered. This is such a beautiful review. I am overwhelmed. Thank you! I was out shopping today . . . and voila! there it was, calling to me. So I bought myself an early Christmas, based on your recommendation. Of course, NOW I’ll have to find time to read it . . . . This sounds like a wonderful book released at a wonderful time. Every review I read makes me look forward to it even more. I’m currently doing a 4/40 challenge and I printed out my goal chart and hung it on the side of the fridge next to my kettle. Now, while I wait for my morning tea to steep I remember to drink a glass, or two, of water. It’s getting to be a habit! Canning class: We teach you to preserve it now, enjoy it later. The first lesson: Artichokes.